*INDIANAPOLIS — *Rick Gosselin, Pro Football Hall of Fame voter and longtime sports writer, recently published his annual NFL special teams rankings, and they appear to show why the Indianapolis Colts had so many close games this year. As a team the Colts’ special teams units ranked ninth overall in the NFL with a score of 310 (the Buffalo Bills and Oakland Raiders were tied for seventh with 309.5) based on Gosselin’s popular formula. General manager Chris Ballard’s influx of youth across the roster, combined with the veteran experience of future Hall of Fame kicker Adam Vinatieri, meant that field position battles and always-important field goals in a tight game would be determined on fourth downs and strong special teams. Obviously not every bounce — or many, for that matter — went the Colts’ way during 2017, but the team still finished in the Top 5 in eight of the 22 special teams categories: kickoff coverage (fourth), punt coverage (third), Net Punting (fourth), points allowed (tied for first) , blocked kicks (tied for third), takeaways (tied for second), giveaways (tied for first) and penalties (fourth). That’s a surprisingly impressive list for a 4-12 team, but also a way to measure inexperienced, raw talent that could be on the verge of even bigger things on both offense and defense. Here’s a review of the play of the Colts special teams in 2017. Vinatieri, much like running back Frank Gore, seemed on the cusp of an all-time NFL record or milestone every single week throughout 2017. By the end of the year his 2,487 total career points moved him into second place all-time, trailing Morten Anderson by only 58 points. Seeing as the 22nd-year pro has reached at least 100 points for the season an NFL record 20 times — a milestone he reached once again after scoring 10 points at Baltimore Dec. 23 — the league is likely to recognize Vinny as the most celebrated scorer in NFL history during 2018. Last season was just another opportunity for the kicker to show his nerves of steel, leadership and ability to adapt as he inherited a new long snapper in Luke Rhodes and a new holder, rookie punter Rigoberto Sanchez. Another way he showed it was what many media members touted as the most impressive extra point ever. A 43-yard attempt, after a penalty, in a Buffalo blizzard to tie the game at 7 with only 1:16 left seemed almost impossible—but it was Vinatieri. He hit what looked like a pitching wedge into a hurricane and the looping kick managed to fight back between the uprights. He would end up missing a 43-yard last-second field goal attempt that pushed the game to overtime, but it was still a moment he will always be remembered for. The South Dakota State product also was named the AFC Special Teams Player of the Week for Week 5, a 26-23 overtime win against the San Francisco 49ers. It marked the 17th time he had earned the award in his career, which is the most by any player in NFL history. 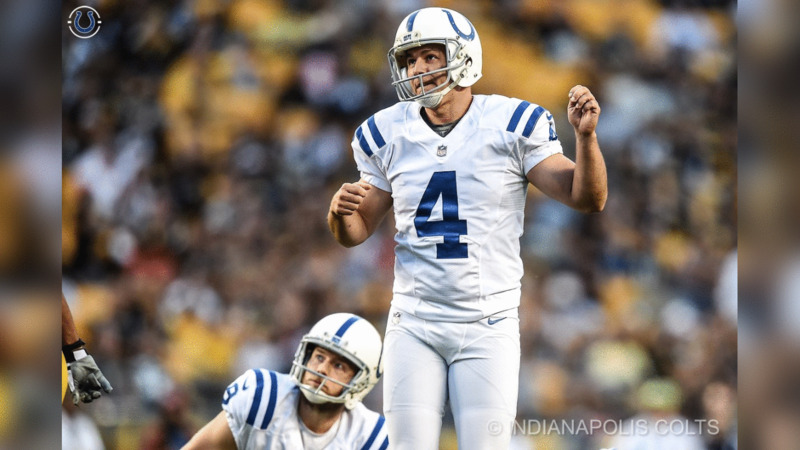 Vinatieri converted 4-of-4 field goal attempts (52, 51, 38 and 23 yards) and two PATs for 14 points. When his 51-yard field goal attempt in overtime split the uprights, it was his 27th career game-winning kick. Vinatieri has 24 game-winning field goals in the regular season in the final minute of the fourth quarter or overtime and 10 game-winners in overtime, both the most in NFL history. On the field goal, he also moved into second place all-time in NFL history in field goals made with 539. Sanchez’ first NFL play was a kickoff for a touchback to open the season in Los Angeles against the Rams. He was joined by Rhodes for his second professional play as Vinatieri made a 20-yard field goal later in the opening quarter against L.A. with the two young players fulfilling their snapping and holding duties, respectively. In his first-career NFL game, Sanchez booted six punts for a 50.3-yard average (47.8 net average) and had two punts downed inside the 20-yard line to start an impressive campaign that would eventually earn him a spot on the 2017 NFL All-Rookie Team by the Professional Football Writers of America (PFWA). Sanchez in 2017 finished with a franchise rookie record of 84 punts for 3,764 yards. His 44.8 punting average ranks third in team history and he also contributed 46 touchbacks on kickoffs for a 65.7 kickoff touchback percentage, which ranked seventh in the NFL. Filling the big shoes of retired fan favorite Pat McAfee, “Rigo” was a huge contributor to the Colts’ special teams units, which ranked third in the league in both kickoff return coverage (19.2 yards per return) and punt return average (4.2). Indianapolis only allowed 80 yards on punt returns this season, which were the second-fewest in the NFL. Gil Brandt, NFL Media senior analyst for NFL.com, named Sanchez to his 2017 All-Rookie Team earlier this week and gave his thoughts on the specialist. Rhodes, who was also seeing time at inside linebacker and on other special teams units during the preseason, turned his sole focus to long snapping after the team traded rookie Thomas Hennessy to the New York Jets on Aug. 28, having won the offseason battle to see who would be the Colts’ newest long snapper. If the mark of success for a long snapper is not to be seen or heard, then Rhodes certainly did his job in 2017, as he appeared to have no major snapping snafus. The Colts blocked three kicks during the 2017 season. Henry Anderson blocked a Cincinnati Bengals field goal attempt, Margus Hunt blocked a Pittsburgh Steelers extra point attempt and rookie linebacker Anthony Walker blocked a Baltimore Ravens punt. Kenny Moore II, who also saw a growing amount of snaps at cornerback throughout 2017, led the Colts in special teams tackles with eight. Chris Milton finished second with six special teams stops, while linebackers John George and Barkevious Mingo tied for third (five), also each contributing a fumble recovery. 22: Adam Vinatieri’s number of years in the NFL is within two years of the age of 38 of the players currently on the Colts’ active roster, IR list and Reserve/Future signings.